Optional: ½ small jalapeno pepper, minced or a dash of red pepper flakes. A lot of us in the functional medicine world talk about ‘eating a rainbow.’ This refers to getting a daily dose of as many bright colored veggies and fruits as possible to get all those healthy polyphenols and other plant constituents that create those colors into our body on a regular basis. Why? Because they heal, nourish, and prevent disease, especially by reducing inflammation and boosting our body’s natural detoxification powers. For women, they’re especially powerful for hormonal health and also cancer prevention. The picture I posted on Instagram of the Mexican Rainbow Cabbage Salad got so many ooh’s and ahh’s because it really looks like a rainbow, that I promised to post the recipe. This simple salad is surprisingly packed with flavor, and if you’re trying to “eat a rainbow” – this salad is a great addition to your repertoire. I particularly love it with Fajita chicken and guacamole. 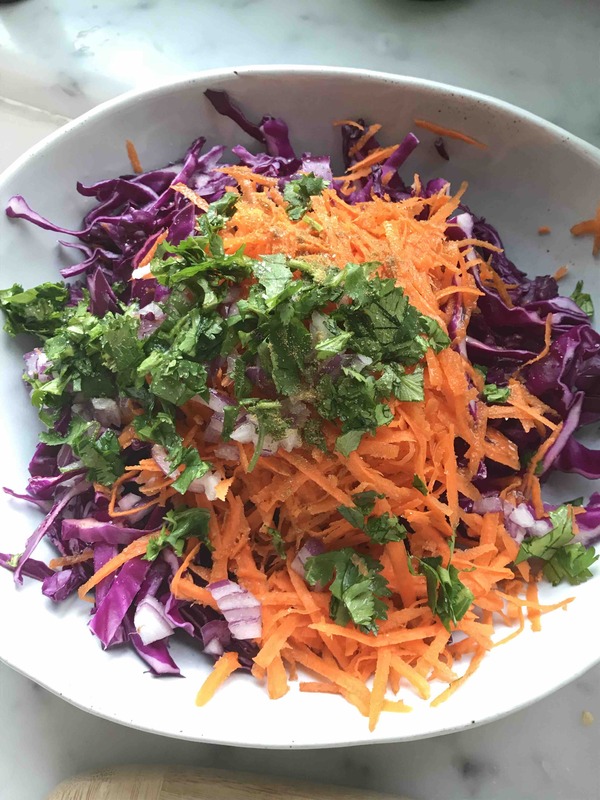 Don’t worry if you have a thyroid problem – even though this contains raw cabbage it’s safe to eat – just keep it to no more than 1-2 times/week and enjoy as a side salad rather than a heaping plate of it. This salad does contain nightshades – you can remove the red pepper and pepper flakes if you avoid those and still enjoy this dish. (Use organic veggies whenever possible). Prepare all of your vegetables as described above and mix in a serving bowl. Toss with lime and seasonings. Serve. Serves 4 as a small side, or 2 as a main salad. Can easily be doubled. Prep time: 10 minutes. Seriously, that’s all it takes.